Share the post "Cucamelons or Tiny Watermelons With a Cucumber Taste"
These bizarre-looking tiny, light-green doll’s house-sized ‘watermelons’ is not some genetically-modified hybrid grown in a laboratory. It’s a central American delicacy that’s been eaten in Mexico for centuries. Fruits can be eaten raw, pickled just like French gherkins, used in salads, added to sandwiches or they also can be chopped and added to salsas for extra texture and flavor. They are also terrific in stir-fries. 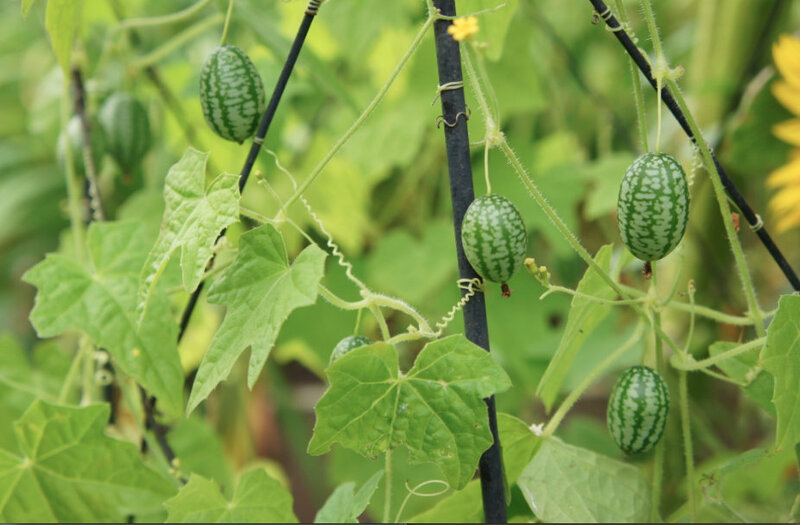 Cucamelons are totally easy to grow. They can be grown in tubs, pots, or growbags. They don’t need to be in a greenhouse, fancy pruning or training techniques and suffer from very few pests. Sow the seed from April to May indoors and plant out when all risk of frost is over. Sown in April, they take two to three months to mature. Despite their exotic origins, they are easier to grow than regular cucumbers. Similar to the cucumber, these plants are monoecious, producing both male and female flowers on the same plant. These plants can pollinate themselves, but the individual flowers are not self-fertile. Flowers are small and yellow, about four millimeters in diameter. Fruits develop at the base of the female flower. They also taste great pickled. – They can be pickled whole, however slicing these little fruit in half and pre-salting them will make them far more crispy. – Pour the vinegar into a bowl and add salt and sugar, stir until they have completely dissolved. Add dill, mint and coriander seeds. – Scrunch up the grape or oak leaf and place it on top of the cucamelons. The tannins in the leaf will slowly disperse outwards and help keep the fruit crisp. – Pour the seasoned vinegar into the jar to cover the fruit, seal the jar and give it a good shake. – Refrigerate for 1 week if sliced and for about 2 weeks if whole. The cucamelons will be pickled and ready to eat. Once opened, store in the refrigerator. 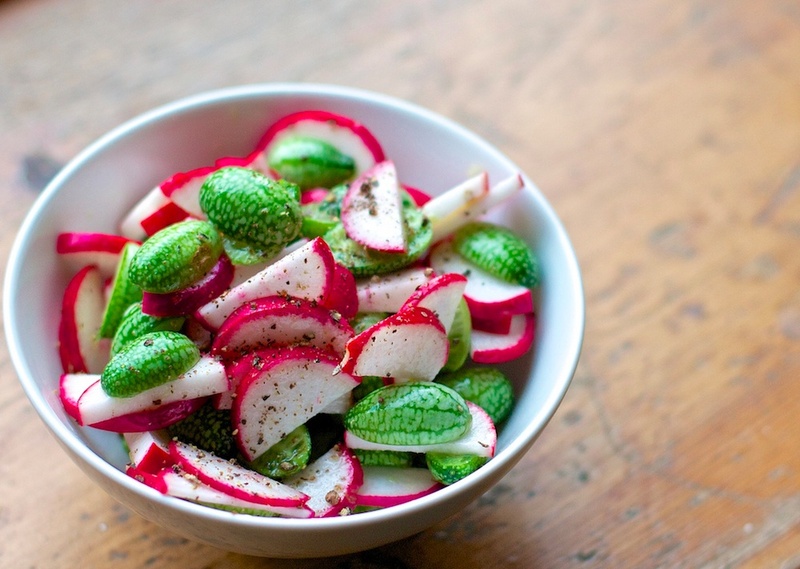 – Put cucamelons, chili pepper, onions, basil (or mint) in a bowl. – Mix the rest of the ingredients in a jar – shake until emulsified. – Pour over prepared vegetables and stir them well, season if needed. – Spoon over toasted bread. 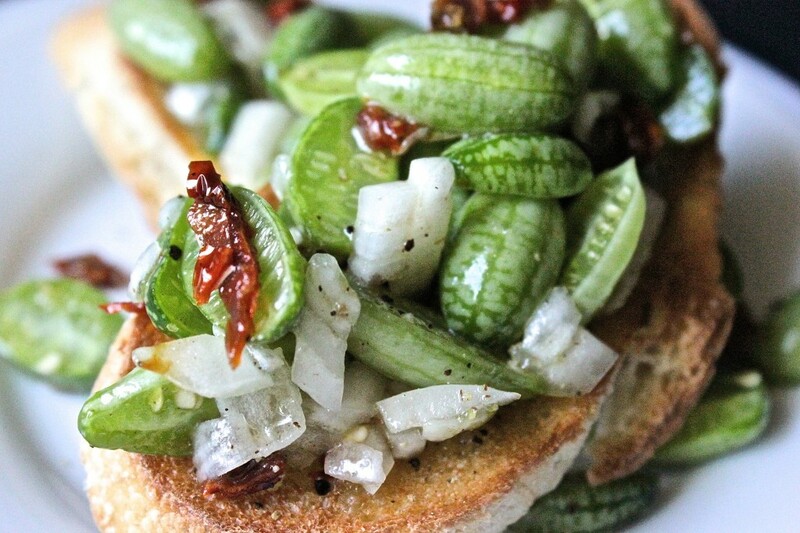 Do you grow Cucamelon (Mexican Sour Gherkin) in your garden? What is your experience with this plant? Please share in the comments below! 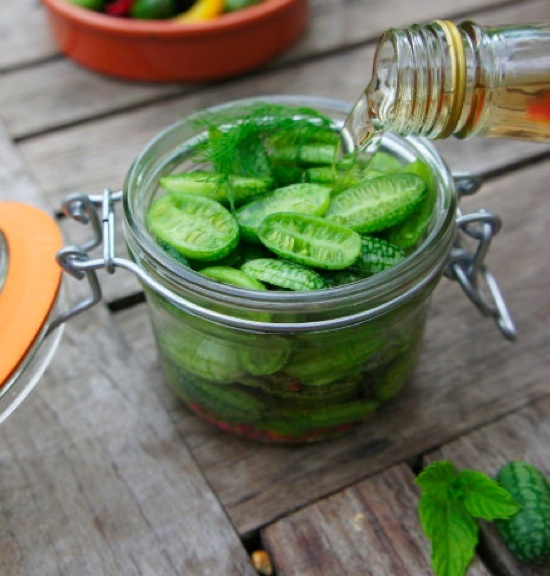 Do you sell Cucamelon (Mexican Sour Gherkin) seeds or have plants for sale? You can place your advertisement here. Contact us now!